DAY CARE CENTERS AND SCHOOLS FIRED BY FELIPE CALDERON HINOJOSA. IS A RELATIVE OF FELIPE CALDERON AND EDUARDO BOURS, THE NAME OF MARCIA MATILDE ALTAGRACIA GOMEZ DEL CAMPO TONELLA, APPEARS ON THE PROPERTY PUBLIC REGISTRY. SHE IS THE OWNER AND THE RELATIVE OF CALDERON AND BOURS. THIS DAY CARE CENTER "ABC" WAS FIRED AND 49 BABIES DIED. THIS DAY-CARE CENTER HAS A LICITATION OF THE SOCIAL SECURITY IMSS. ANOTHER DAY-CARE CENTER BELONGS TO THE NARCOTICS TRAFFICKERS TEAM OF FELIPE CALDERON. Between the beneficiaries by the direct IMSS concessions of the day-care centers in Sinaloa, appears Maria Teresa Zambada Fog, daughter of one of the heads of the Sinaloa's cartel, ISMAEL "MAYO" ZAMBADA. The present partners of one of the day-care centers, call “ESTANCIA INFANTIL NIÑO FELIZ”, are: “Maria Teresa ZAMBADA Fog, Maite Diaz ZAMBADA, Javier Ernesto Diaz ZAMBADA and Rosa Maria Zazueta ZAMBADA”, this was mentioned by IMSS on her web page, and over there the IMSS published the list of subrogated day-care centers. CHILD FIRED IN THE DAY-CARE CENTER "ABC" IN HERMOSILLO, SONORA. THIS CRIMINAL "FELIPE CALDERON HINOJOSA" IS OBLIGATED TO GIVE THE INDEMNIFICATION TO ALL AFFECTED PEOPLE AND PARENTS OF THE CHILDREN FIRED. NOT ONLY OF THIS DAY-CARE CENTER ABC FIRED. BUT FOR ALL THE DAY-CARE-CENTERS FIRED. F. CALDERON MUST PAY THE INDEMNIFICATION IMMEDIATELY OTHERWISE PEOPLE WILL TAKE THE JUSTICE IN THEIR HANDS. ANOTHER ATTEMPT FAILED IN REYNOSA TAMAULIPAS THE NAME OF THIS DAY-CARE CENTER IS "MI BEBE" AND BELONGS TO AN EX-DIPUTY MARIO ALEJOS SALINAS AND HIS WIFE MARIA DEL CONSUELO IVONNE FISHER WHO HAVE MANY OTHERS DAY-CARE CENTERS ON THE BORDER CITIES. ANOTHER FAILED ATTEMPT IN ANOTHER DAY-NURSERY IN CD. VICTORIA TAMAULIPAS. OTHER OWNER OF ANOTHER DAY NURSERY CARE IS A DIPUTY OF THE SAME POLITICAL PARTY OF CALDERON "PAN" HER NAME IS: MARIA DEL CONSUELO ARGUELLES ARELLANO. AND THE NAME OF THE DAY-CARE CENTER IS: "GOTITA DE AGUA" BETWEEN THE 10 THE PARTNERS OF THIS DAY-CARE CENTER ARE RELATIVES OF FELIPE CALDERON TOO. THE MUNICIPAL PRESIDENT OF ZACATECAS "CUAUHTEMOC CALDERON GALVAN" AND HIS WIFE "NADIA GISELA SANCHEZ VARGAS"
ANOTHER PARTNER IS THE "MUNICIPAL REGIDOR" "OSVALDO CONTRERAS VAZQUEZ. ANOTHER OWNER OF A DAY-CARE CENTER IS: "MONICA BORREGO ESTRADA" SISTER OF "GENARO BORREGO ESTRADA" THE EX-GOBERNOR OF ZACATECAS. HER DAY-NURSERY CARE IS "QUERUBINES"
ALL THESE DAY-CARE CENTERS I'VE MENTIONED ARE SUBROGATED BY THE IMSS. ANOTHER NURSERY CARE FIRED BY A SHORT CIRCUIT (ALL THE DAY-CARE CENTERS WERE FIRED BY A SHORT CIRCUIT, COINCIDENCE? 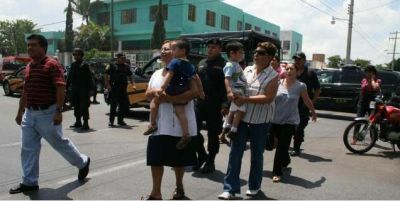 OF COURSE NOT) WAS IN CHETUMAL QUINTANA ROO 60, CHILDREN HAD TO BE EVACUATED. MOST OF THE DAY-CARE CENTERS AROUND THE MEXICAN REPUBLIC BELONG TO PEOPLE FROM POLITICAL PARTIES OR DIFFERENT MOODY GOVERNMENT OFFICES LIKE THIS ONE CALLED 0910 ADMINISTRATED BY THE "CANACO" (CAMARA NACIONAL DE COMERCIO Y SERVICIOS TURISTICOS) LOCATED IN: Laguna de Vacalar Miraflores Colony in CHETUMAL QUINTANA ROO. 60 CHILDREN HAD TO BE EVACUATED THE PARENTS ALARMED RUN FOR THEIR CHILDREN. MOST OF THE DAY-CARE CENTERS IN MEXICO HAVE IRREGULARITIES. BUT GOVERNMENT AS USUAL DON'T DO NOTHING. ANOTHER NURSERY-CARE CENTER WAS FIRED IN MERIDA YUCATAN. 34 CHILDREN HAD TO BE EVACUATED FROM THE DAY-CARE CENTER "PALMERSTON" FOR A SHORT CIRCUIT IN THE WAREHOUSE. ANOTHER DAY-CARE FIRED IN MERIDA YUATAN. THIS DAY-CARE CENTER CALLED: COLEGIO PENINSULAR ROGERS HALL, WAS EVACUATED AND THE OWNER OF IN THIS SUBROGATED CENTER THE OWNER IS: VICTOR MANUEL AVILA ROSADO. A LOT OF PEOPLE WITH INJURIES BETWEEN TEACHERS AND PERSONNEL WERE TAKEN TO DIFFERENT HOSPITALS AS WELL AS CHILDREN AND SOME PARENTS AFFECTED FOR NERVOUS CRISIS. OR DAY-CARE CENTER WAS OPENED AGAIN BY ORDER FROM JOSE ANTONIO GARCIA, THE IMSS DIRECTOR. WHO PROMISES SECURITY DOORS AND ALL THE NECESSARY IN TWO MONTHS. INCREDIBLE! THERE ARE 440 CHILDREN THERE WITHOUT SECURITY AND THEY HAVE TO WAIT 2 MONTHS TO BE SECURE? AND MEANWHILE? AND DO YOU BELIVE ON HIS PROMISE? DO YOU BELIVE IN HIS WORD? COME ON, TOMORROW THIS GUY WILL FORGET EVERYTHING. AND IN 2 MONTHS EVERYTHING WILL BE IN THE SAME SITUATION. 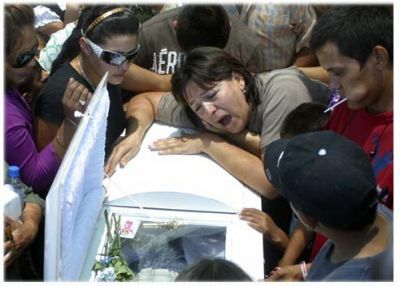 AT LEAST 20 CHILDREN HAVE DIED BECAUSE OF ANOTHER DAY-CARE CENTER FIRED IN HIDALGO MEXICO. THE INJURIED CHILDREN IS UNKNOWN YET. BUT THE DEAD CHILDREN CAN INCREASE IN THE HOSPITAL. AT 5.45 P.M. THE FIRE FINISH WITH THE BIBIOLEC IN THE SCHOOL NAMED: COLEGIO NACIONAL MARIANO ROQUE ALONSO THE FIRE WAS CAUSED AS USUAL BY A SHORT CIRCUIT. ROSA CUEVAS, THE PRINCIPAL SAID THAT THE PRESIDENCY DON'T CARE THIS SITUATION BECAUSE THEY HAVE NEVER RECEIVED ANY HELP. AND THE MINISTER OF EDUCATION NEVER RESPOND AS WELL. AN ELEMENTARY SCHOOL FIRED IN SANTA MARIA LA RIVERA COLONY. IT WAS IMPOSSIBLE TO FINISH WITH THE FIRE SAID THE PREVENTIVE POLICEMAN "RAMON RODRIGUEZ", THE FIRE BURNED UP, BOOKS, DIDACTIC MATERIAL, TABLES, DESKS, AND EVERYTHING. 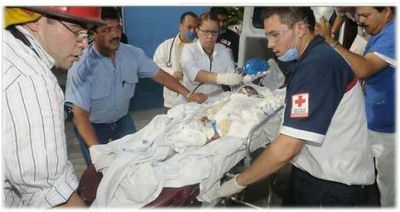 A POLICEMAN WAS INTOXICATED, THE AMBULANCE TOOK HIM TO THE HOSPITAL.